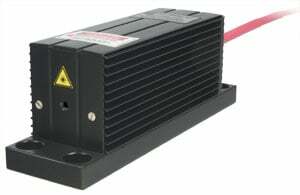 A wide range of passively Q-switched lasers with pulse durations below 1 ns and extremely high peak powers at 1064 nm with excellent TEM00 beam profile are offered by ALPHALAS. The PULSELAS®-P lasers feature proprietary microchip design. The monolithic laser cavity is permanently aligned and therefore extremely stable. The high-energy models deliver more than 1.5 mJ pulses with pulse duration of 1 ns, resulting in the highest peak power >1.5 MW commercially available directly from an oscillator (without amplifiers) for microchip lasers. Various models operate with repetition rates up to 100 kHz and the average power ranges from 100 mW to 1 W.
Built-in frequency generator and external TTL triggering are standard features for most models. Optional conversion to green (532 nm) and ultraviolet (355 nm, 266 nm) is also available. The extremely reliable and robust microchip design is perfect for advanced OEM industrial applications. The compact design is best suited for almost any system integration. Fiber-pumped options offer even more compactness and flexibility. These unique lasers have an extremely broad spectrum of applications ranging from supercontinuum generation in photonic crystal fibers to ignition of combustion engines and micromachining.